If you're looking for a great (and cheap!) hotel in Niagara Falls, Canada, CheapTickets is the best place to find them. We offer deals on the best 323 hotels throughout Niagara Falls, Canada. No matter what you're looking for, we have options for you. Grab great rates on the 162 affordable 3-star hotels that are easy on the wallet without sacrificing comfort. Looking for more luxury? Try one of the 38, 4-star hotel accommodations in Niagara Falls, Canada. No matter your budget needs, we've pulled out all the stops to make sure you have plenty of vacation options. Maybe you prefer to search for your hotel deals based on what each hotel offers? For example, let's say you just want to find a hotel or resort that has a pool to cool off in after a long day exploring Niagara Falls, Canada. Scroll down to choose from the 118 hotels in Niagara Falls, Canada that has a pool for guests. Or search for deals on Niagara Falls, Canada hotels offering free wifi or breakfast, non-smoking rooms, and more! CheapTickets is here to be your personal travel agent for your next trip to Niagara Falls, Canada. Get booking today! What hotels in Niagara Falls, Canada offer free wifi access? Are there deals on Niagara Falls, Canada hotels offering free breakfast? Yes! The only thing better than finding a great deal on a cheap hotel in Niagara Falls, Canada is finding one that offers free breakfast. Grab some eggs, a waffle, or some healthy oatmeal before a day full of exploring Niagara Falls, Canada and all that it has to offer. Below are just some of the many hotels that offer free breakfast in Niagara Falls, Canada. Ramada by Wyndham Niagara Falls/Fallsview is a 3.00 star rated hotel property in Niagara Falls, Canada that offers free breakfast. Comfort Inn The Pointe is a 2.50 star rated hotel property in Niagara Falls, Canada that offers free breakfast. Crowne Plaza Niagara Falls Fallsview is a 3.50 star rated hotel property in Niagara Falls, Canada that offers free breakfast. Embassy Suites by Hilton Niagara Falls Fallsview is a 4.00 star rated hotel property in Niagara Falls, Canada that offers free breakfast. What about deals on pet-friendly hotels in Niagara Falls, Canada? Niagara Falls, Canada is a great place to get outside and explore with your pets in tow so don't leave your furry friends behind. Below you'll find great deals on hotels in Niagara Falls, Canada that allow pets. Don't forget to bring plenty of treats! 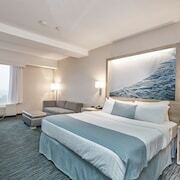 Four Points by Sheraton Niagara Falls Fallsview is a popular, pet-friendly, 3.50 star hotel in Niagara Falls, Canada. Four Points by Sheraton St. Catharines Niagara Suites is a popular, pet-friendly, 3.00 star hotel in Niagara Falls, Canada. Radisson Hotel & Suites Fallsview is a popular, pet-friendly, 3.50 star hotel in Niagara Falls, Canada. 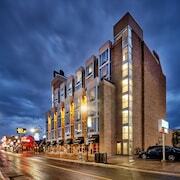 Oakes Hotel Overlooking the Falls is a popular, pet-friendly, 3.50 star hotel in Niagara Falls, Canada. Any good rates on Niagara Falls, Canada hotels with restaurants? Absolutely. Don't want to deal with planning our all your meals on your trip to Niagara Falls, Canada? We don't blame you. Keep the hangry away by staying in one of the 75 hotels that have restaurants. With a room at one of these spots, all it takes to get a good meal is hopping in the elevator. Check out some of the most popular hotels in Niagara Falls, Canada that have restaurants below. Book Best Western Plus Cairn Croft HotelBest Western Plus Cairn Croft Hotel is a 3.00 star hotel and has one or more restaurant options. Book Great Wolf Lodge Niagara FallsGreat Wolf Lodge Niagara Falls is a 3.50 star hotel and has one or more restaurant options. Book Sterling Inn & Spa - an Ontario's Finest InnSterling Inn & Spa - an Ontario's Finest Inn is a 4.00 star hotel and has one or more restaurant options. Book Days Inn by Wyndham FallsviewDays Inn by Wyndham Fallsview is a 2.00 star hotel and has one or more restaurant options. What are the cheapest hotels in Niagara Falls, Canada with pools? What's better after a long day exploring Niagara Falls, Canada then a relaxing dip in a pool? Finding the Niagara Falls, Canada hotel you need for a bargain! Cool off and unwind at one of our 118 Niagara Falls, Canada hotels with a pool. Browse some of the top deals on these hotels and resorts with pools in Niagara Falls, Canada below, but be warned: You may not want to check out! Best Western Fallsview has a pool and a 3.00 star rating. Clifton Victoria Inn at the Falls has a pool and a 2.50 star rating. White Oaks Resort & Spa has a pool and a 4.00 star rating. Old Stone Inn Boutique Hotel has a pool and a 3.50 star rating. What hotels in Niagara Falls, Canada offer parking for guests? Once you've made your way to Niagara Falls, Canada, the last thing you want to deal with is finding parking close to your hotel. Avoid the hassle of parking around the block and carrying your luggage all the way to the lobby by booking one of our hotels with parking. 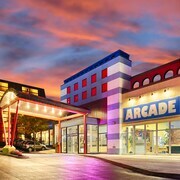 Check out deals on some of the 188 hotels in Niagara Falls, Canada that offer parking for guests. Comfort Inn Fallsview This hotel has a 2.50-star rating. Comfort Inn This hotel has a 2.50-star rating. Wyndham Garden at Niagara Falls This hotel has a 3.00-star rating. 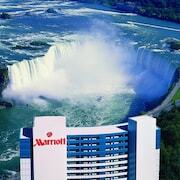 Marriott Niagara Falls Fallsview Hotel & Spa This hotel has a 4.00-star rating. Do Niagara Falls, Canada hotels offer 24-hour concierge services? When you're on vacation, things don't always go according to plan. Travel with peace of mind when you book one of our 41 hotels in Niagara Falls, Canada with 24-hour concierge service. That way you know help is always phone call or elevator ride away. Try The Giacomo- An Ascend Hotel Collection Member. It's a 3.00 star rated hotel in Niagara Falls, Canada that offers concierge services 24 hours a day. Try Niagara Falls Marriott on the Falls. It's a 4.00 star rated hotel in Niagara Falls, Canada that offers concierge services 24 hours a day. Try Sheraton On The Falls Hotel. It's a 4.00 star rated hotel in Niagara Falls, Canada that offers concierge services 24 hours a day. 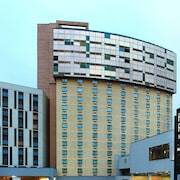 Try The Tower Hotel Fallsview. It's a 3.50 star rated hotel in Niagara Falls, Canada that offers concierge services 24 hours a day. What about low rates on non-smoking hotels in Niagara Falls, Canada? White Oaks Resort & Spa This hotel has a 4.00-star rating. Niagara Lodge & Suites This hotel has a 2.00-star rating. Ramada by Wyndham Niagara Falls Near the Falls This hotel has a 2.50-star rating. Days Inn by Wyndham Fallsview This hotel has a 2.00-star rating. What are the cheapest Niagara Falls, Canada 3-star hotel deals? Our 3-star hotels bring you quality accommodations at a lower price point for the perfect, budget-friendly vacation in Niagara Falls, Canada. With 162 3-star hotels throughout Niagara Falls, Canada to choose from, you still have options. Browse our selection below. Four Points by Sheraton Niagara Falls Fallsview. 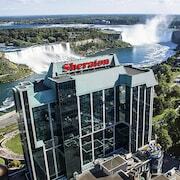 Four Points by Sheraton Niagara Falls Fallsview places guests less than a mile from the world-famous cascades. The hotel is connected to Fallsview Casino and is within a mile of IMAX® Theatre Niagara Falls and the Skylon Tower. Guests travel 2 miles (3.2 km) for Hornblower Niagara boat tours. Oakes Hotel Overlooking the Falls. This Niagara Falls hotel overlooks the Horseshoe Falls; Fallsview Casino is next door, and Clifton Hill's world famous Street of Fun by the Falls is less than 2 km (1 mi) away. Radisson Hotel & Suites Fallsview. This modern hotel is two blocks from Niagara Fallsview Casino, three blocks from Horseshoe Falls,in the city center, and less than a mile from the Clifton Hill entertainment district. The Tower Hotel Fallsview. The hotel occupies the top floors of The Tower Hotel building, 2 blocks from Niagara Fallsview Casino, 172 m (0.11 mi) from the Falls and Queen Victoria Park to the Maid of the Mist, and 0.3 km (0.2 mi) to Horseshow Falls and Journey Behind the Falls. What are the best deals on 4-Star Hotels in Niagara Falls, Canada? Niagara Falls, Canada is full of hotels and it can be hard to narrow down where you really want to stay. Luckily, we've done that hard work for you be narrowing you from 323 hotels throughout Niagara Falls, Canada, to the 38 4-star hotels in Niagara Falls, Canada. Our 4-star hotels in Niagara Falls, Canada are exactly what you need for your next family trip, romantic weekend, or solo getaway. Check out our most popular deals below. 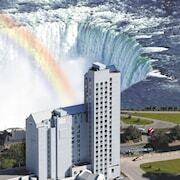 Marriott Niagara Falls Fallsview Hotel & Spa: This hotel, with a skywalk to Fallsview Casino, is 100 m (109 yd) from the brink of Niagara Falls and 1 km (a half-mile) from <i>Maid of the Mist</i> boat tours, and the Clifton Hill entertainment district. Hilton Niagara Falls/Fallsview Hotel & Suites: Connected by a glass-enclosed walkway to the Fallsview Casino, this Niagara Falls luxury resort hotel is 1 block from the Horseshoe Falls and less than a mile from Clifton Hill. What are the best activities to do in Niagara Falls, Canada? American-Side Tour of Niagara Falls with Maid of the Mist Boat Ride: Starting at just $105 per person. Canadian Illumination Tour of the Falls: Starting at just $105 per person. Canadian Tour of the Falls & Boat Ride: Starting at just $110 per person. Bird Kingdom Niagara Falls: Starting at just $16 per person. Room is very clean and the view is the best among all the hotels in Niagara Falls. Wonderful one night stay and use of the waterpark both days! Very crowded when it came to dinner though...about a 30 min wait. Everything was perfect the location, rooms the swimming pool. Te ofrce una hermosa vista a las cataratas. Espectacular y único. 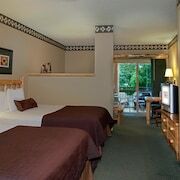 Large and quiet room with a indoor pool.5 minutes walk from the falls. everything was nice and all but there was no area that served food early in the morning or late at night.